If you thought LittleBigPlanet's level creator was impressive, wait until you see what LittleBigPlanet 2 has in store. If information coming out of NeoGAF is accurate, the June 2010 issue of Game Informer is set to confirm the release of Sony and Media Molecule's LittleBigPlanet 2 for the PlayStation 3. Players won't only be creating levels this time though, they'll be creating entire games. 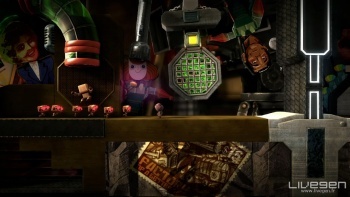 According to the post, LittleBigPlanet 2 encourages players to create game types, including "shooters, racers, puzzle games, Space Invaders clones, and even RPGs." For example, a Media Molecule developer has already created a Command & Conquer clone. Players (designers?) can create their own HUDs (health bars, etc. ), record their own sounds, and create enemies with unique and deeper AI than in LittleBigPlanet. The ability to make cutscenes and short films is also being implemented. One of the most awesome bits of info is how levels can be saved to a QR code and printed out. When the QR code is put in front of the PlayStation Eye, it'll load up the level. LittleBigPlanet 2 will also give players a unique profile online where people can preview their stages. Story mode will focus more on periods of time rather than regions, and will work much in the same way as the first game with 3-planes to move between. The NeoGAF post has spoilers for some of the levels if you care to read about them. LittleBigPlanet DLC and costumes will thankfully transfer over to the sequel as well, so you can still be a Medusa wearing a tutu if you choose. Sony and Media Molecule had plenty of trouble dealing with players' creations from the now seemingly limited level creator in LittleBigPlanet, and it seems like they'll have a much grosser can of worms on their hands with a complete game editor. If that's what they want to get themselves into, fine, because this stuff sounds incredible.